· However, after Stalin’s death she gradually became reaccepted into the Russian literary scene. · Akhmatova employs a conversational style filled with simple language and every day speech that makes her poetry seem personal or confessional and enabled her to appeal to that wide cross-section of Russian people who had experienced the same horrific conditions as she under Communism. Akhmatova’s life spanned the time between the pre-Revolutionary and post-Stalin eras of Russian history. Despite terrible persecution and censorship by the State, her poetry gave voice to the Russian people during times of great upheaval in Russian society. She did so with verse that is original and strikingly modern. 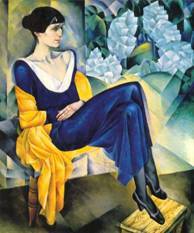 Akhmatova outlived her persecutors, and her life has become a symbol of truth and integrity. When the American national poet Robert Frost visited her in 1962, Akhmatova said: "I've had everything – poverty, prison lines, fear, poems remembered only by heart, and burnt poems. And humiliation and grief. And you don't know anything about this and wouldn't be able to understand it if I told you..." but her poetry is able to give us at least a glimpse of the momentous and horrifying times that she lived through.